7. So what have plant viruses ever done for virology and molecular biology? 14. How does vaccinia virus interfere with interferon? Advances in Virus Research, Volume 100 presents the latest release in this ongoing series that provides the broadest topical coverage. 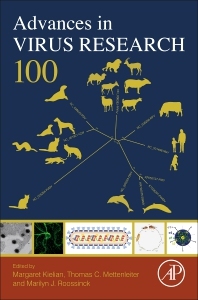 New sections to this release include the species problem in virology, a short intro/history of AVR, the role of immune responses in HIV and mother-to-child transmission, autophagy/polio/dengue, ASFV biology and vaccine approaches, morbillivirus pathogenesis, viruses of plant-interacting fungi, parvovirus evolution, protein localization and interaction studies in plants, respiratory coronaviruses and their reservoirs, H5N8, an orchestra of reovirus receptors, antiviral immune response and the route of infection in Drosophila melanogaster, and more.